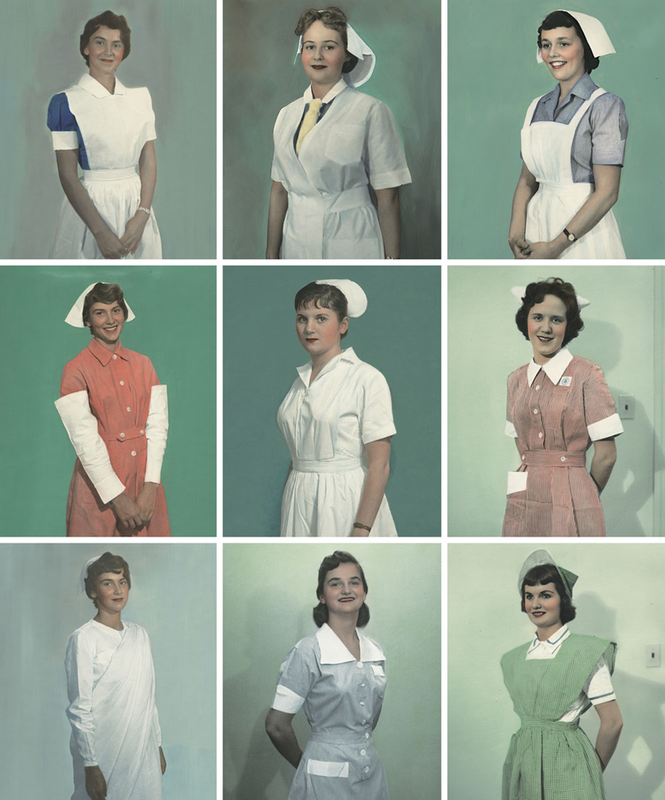 This essay on the International Nurse Uniform Photograph Collection, ca. 1950 was originally published in Hidden Treasure: The National Library of Medicine, 2011. The collection of photographs was developed by the Helene Fuld Health Foundation and consists of 93 hand-colored 8×10 photographs. It is republished here today in honor of National Nurses Week. The nurse’s uniform is a universal code for professionalism, decorum, efficiency, esprit de corps, and commitment to humanitarian values. Originally introduced to distinguish the untrained traditional nurse, who dressed in the everyday women’s wear of her class, from the trained and licensed modern nurse, clad in a neat, clean, and well-fitting uniform, it was a synthesis of various influences—the parlor maid, the religious sister, and military apparel. It varied in time and place, but in every case it helped forge a common occupational and gender identity. Functioning as a sign of authority and institutional discipline for patients and lower-ranking employees, the nurse’s uniform also signified service and subordination to doctors, who were usually men and not required to wear uniforms. 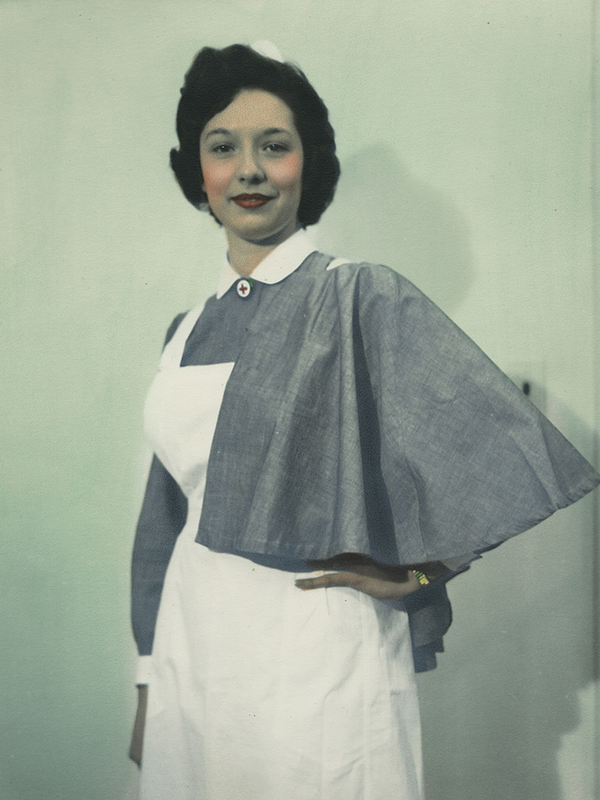 In the 1940s and ’50s, the Helene Fuld Health Foundation, dedicated to the “relief of poverty, suffering, sickness and distress,” focused many of its activities on nursing and produced this set of glossy photographs of nurse uniforms, each representing a nation or region, from Afghanistan to Zanzibar. The costumes differ in detail—the cuffs, capes, hats, aprons, and collars vary—yet all are recognizable as nurses’ outfits. The starched whiteness signifies commitment to hygienic cleanliness, the apron a commitment to service, and so on. Noble traits, universal values. In 1950 the United Nations and World Health Organization were new and hopeful institutions; internationalism was rising. After the terrible war that had just been fought, a new global order seemed to be emerging. The Fuld Foundation surely intended these photographs to contribute to that order, to promote a utopian ideal of global harmony. At the same time the photos have the look of advertisements. In the mid-twentieth century companies began manufacturing more smartly tailored uniforms, and they used women with modern hairdos and makeup who projected a sense of female independence and self-assurance to model them. Fussy styling and accessorizing was avoided; uniform design was meant only to echo the latest fashions while maintaining the modesty of the nurse. Today the occupations of health care providers are not clearly signified by the informal clothing they wear, and some see the relaxation of dress codes as symptomatic of a decline in standards of care. But the transformation of the nurse’s uniform came, in part, from a desire to democratize the medical workplace. Mental health nurses abandoned the uniform in the 1970s in an attempt to reduce the social barriers between nurses and patients. Around the same time, nurses began adopting a feminist view. The hierarchical distinction between doctor and nurse, and the requirement that nurses wear feminine (and sometimes hampering) uniforms, came under attack. The final blow to the formal uniform was the adoption of minimalism in dress in the interest of infection control. Today, in some settings, nurses and doctors are scarcely distinguishable: both don scrubs. But the nurse’s uniform still represents authority over the patient and continues to be an iconic symbol. Anne Marie Rafferty is the former dean of the Florence Nightingale school of Nursing and Midwifery, King’s College London. She holds degrees from: the University of Edinburgh, BSc (Soc Sci) in Nursing Studies; Nottingham University, M.Phil (Surgery); and Oxford University, D.Phil (Modern History). She was awarded the Agnes Dillon Prize for Nursing History from the University of Virginia, the first non-American nurse so honored, and made CBE in the 2009 New Year’s Honours. She presently holds a chair in nursing policy, the first department of its type in the United Kingdom, where her role is to understand how the policy picture fits together. Nepalese Nurses wear a plain white uniform.